My photograph Losing its Aura (Reading Walter Benjamin) was recently shortlisted for the Josephine Ulrik and Win Schubert Photography Prize. 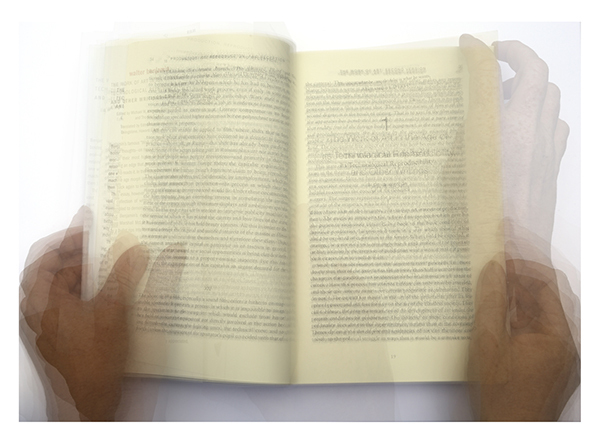 The image is a composite photograph created from a number of photographs I made showing my hands holding and turning the pages of Walter Benjamin’s seminal essay The Work of Art in the Age of its Technological Reproducibility. The work is a response to the text itself and the enormous impact it has had on the photography, media and cultural studies.